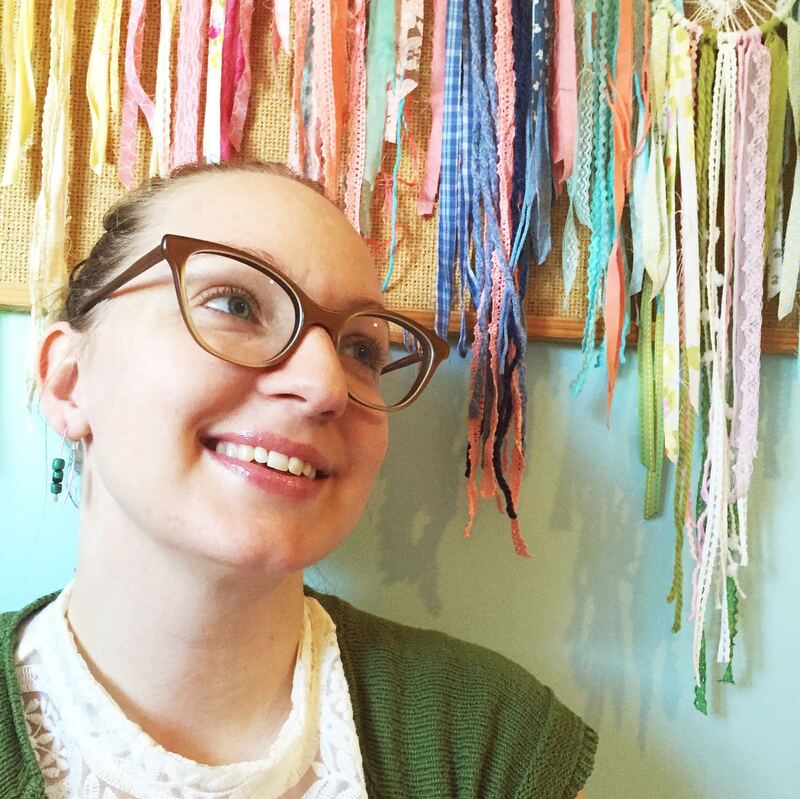 Confession: Our backyard is a sea of dandelions. They’ve taken over any area that we left as lawn. In past years, we tried pulling, mowing, even spraying them with vinegar (we refuse to spray any chemicals). This year, I’ve given up and I’m treating them like just another crop to harvest. Dandelions are such a cheerful thing to harvest. If using the greens, harvest fresh or no more than a day before. They keep in the fridge, but they really are best eaten as soon as possible. When preparing to de-petal the dandelions, pick them no more than a couple hours prior. They are easiest to de-petal when the blossom is big and open. Dandelion blossoms tend to close up and wilt very quickly. In general, I pick a big bowl of blossoms right before making dinner and then 2-3 hours later, after Sam heads to bed, I get comfy on the couch & start to de-petal the blossoms. You can still de-petal dandelions even after they close up, but it’s just a trickier task. Dandelion petals can be frozen! Once you de-petal the blossoms, pop them into a freezer bag or container (I measured out 1 cup bags). This makes life easier when you want to tackle bigger dandelion projects (like dandelion wine) or if you only have a small crop of dandelions and therefore have to combine multiple harvest days to accumulate enough petals. I tried washing the dandelion blossoms, letting them dry, and then de-petaling. It was kind of a fail. Now I don’t even worry about washing the blossoms to de-petal them. You can clean off any bugs you come across while you de-petal each one. Our yard is chemical free, and pet-free, so I just don’t worry about it. I do wash the greens in cold water after I harvest them (just treat them like any other salad greens). Fact: Children love to play with dandelions. They are an easy crop to teach kids to harvest. Sam has really enjoyed helping me pull off blossoms. Even got him de-petaling for a little bit one afternoon. So dandelion harvest time can definitely be a kid friendly task. Dandelion petals ready to be frozen. There are lots of interesting things to make out of dandelions. There’s a good collection of ideas & recipes on The Prairie Homestead blog. I started out simple, just making come dandelion green salads. There’s really no end of possibilities when it comes to salad combinations. 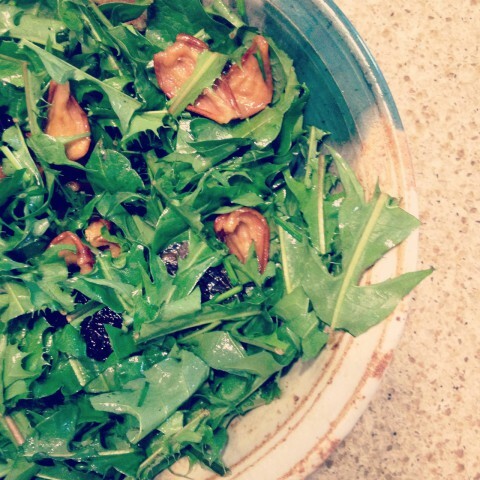 Just think of some of your favourite salads or dressings, and add or substitute dandelion greens. For example, I love broccoli salad, but there’s no broccoli ready to harvest in the backyard, so I used dandelion greens instead, added my usual raisins, nuts, and cream dressing. Viola! I tend to like adding sweet things to salads made with dandelion greens, just to cut the slight bitterness of the leaves. I’m thinking strawberries and sunflower seeds next time around or maybe a sweet rhubarb dressing. Just have fun experimenting with it! 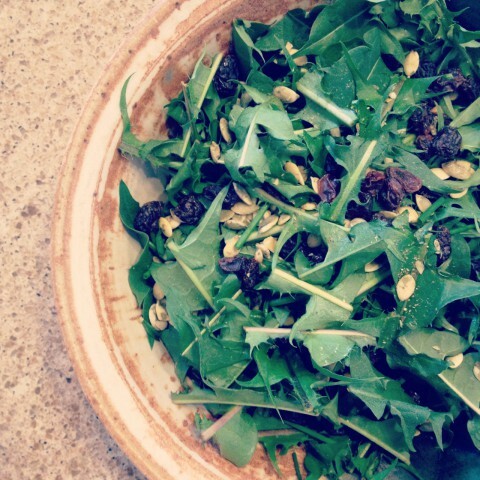 Dandelion green salad with fresh chives, raisins and pumpkin seeds. I made a simple creamy dressing of mayo, vinegar & a touch of sugar. Dandelion green salad with fresh chives. I simmered dried apricots and prunes with coconut oil and a bit of water to form the dressing. Sooooo tasty! 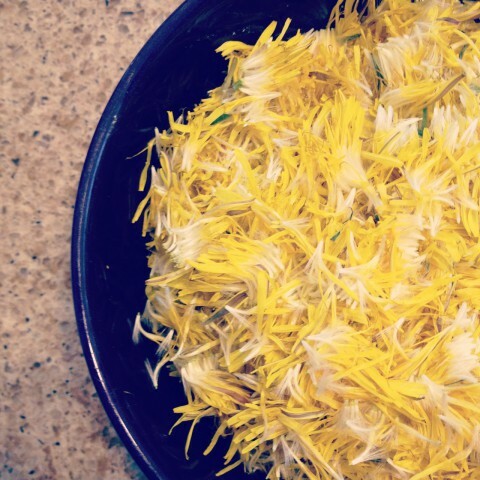 There are several things I want to try making with the dandelion blossoms and petals, including syrup, fried blossoms, and wine (if I’m super ambitious one week). 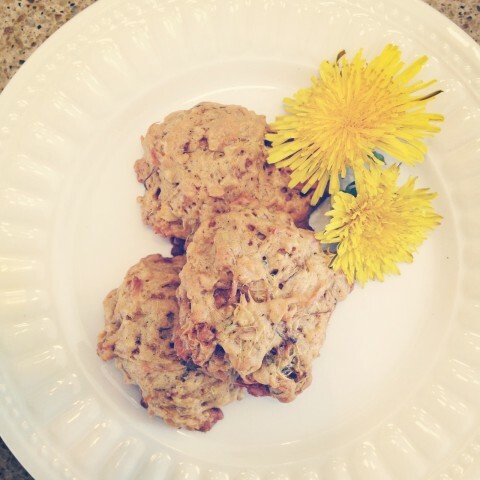 We made dandelion cookies this week from some of the fresh petals. They were yummy and a hit with Sam. I used a recipe from the Dinner For Everyone blog. Since they are basically oatmeal cookies with dandelion petals, I want to try adding raisins to them next time around. Cookies made from dandelion petals. Yummy, but next time I’m going to add some raisins. 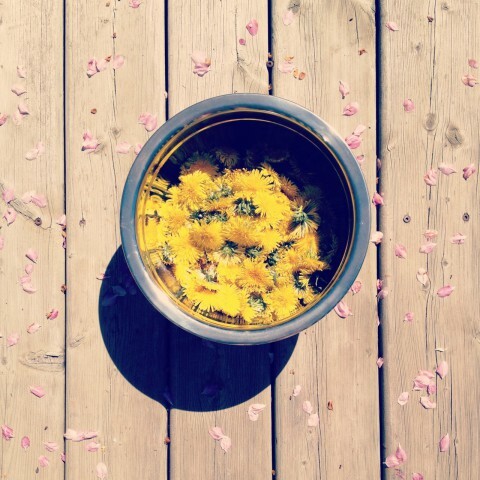 Have you ever done anything with dandelion greens or blossoms? Would love to hear about it! Also, should let you know that if you happen to be one of those lucky folks who don’t suffer from dandelion invasions in your yard (or don’t have a yard), chances are you can purchase dandelion greens from your local urban farmer or grocery store. 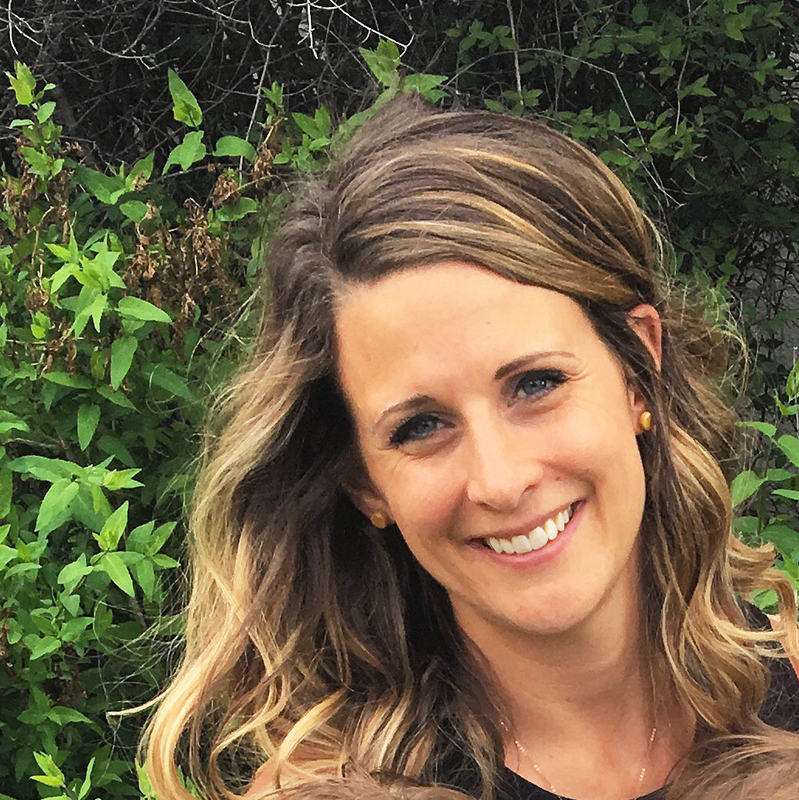 Here in Calgary, you can check out the YYC Growers & Distributors booth at some of their upcoming farmers’ markets. Some of the greens you purchase from them might just be from our yard. Dandelion is one of those plants I’m always trying to talk up. Nobody seems to believe that the field of them in their own backyard is actually edible. It’s like pigweed/lamb’s quarters ( http://en.wikipedia.org/wiki/Chenopodium_album ) , they grow all over the place around here. You should try that too. I love getting the kids to go out an pick a bunch of weeds to have with lunch. Spring has been very slow to come to Calgary. All the garden stuff is at least 2-3 weeks behind in the growing season and we have a short growing season to begin with!! Makes it a little stressful, but so happy to finally see things coming to life and we’ve even got some kale and lettuce that is ready to harvest.